Mosher, who organized the confab with Serge Chapleau of La Presse, brought in several special guests from the U.S. and Europe who gave talks about different aspects of the business. The group also toured the television studios of Et Dieu créa... Laflaque, the popular Radio Canada satirical computer-animated show created by Chapleau. In the only event open to the public, three cartoonists with Canadian connections — Matt Diffee, Anita Kunz and Barry Blitt — took to the stage of McGill University's Moyse Hall to talk about their experiences working for The New Yorker magazine. Blitt, who lives in Connecticut but grew up in Côte St. Luc and studied at Concordia University, is the man who drew the controversial 2008 Michelle and Barack Obama fist-bump cover. But before they were introduced, Liberal MP Justin Trudeau surprised the audience by rolling out from behind the curtains atop a skateboard to give a rousing and humorous opening monologue. Casually dressed in jeans, a white shirt and cowboy boots, he recounted at one point how his father, the late Pierre Elliot Trudeau, never spoke to his young children about politics when he was prime minister. But at the age of seven or eight, the younger Trudeau said he remembered stumbling across a collection of cartoons depicting his famous father. “Here was something that I understood — cartoons, that's easy. So leafing through these books was the first time that I began to get an awareness of what my father actually did,” he said. Other often-caricatured politicos who made special guest appearances over the weekend included former Bloc Québecois leader Gilles Duceppe, and former Prime Minister Paul Martin, an avid collector of political cartoons. 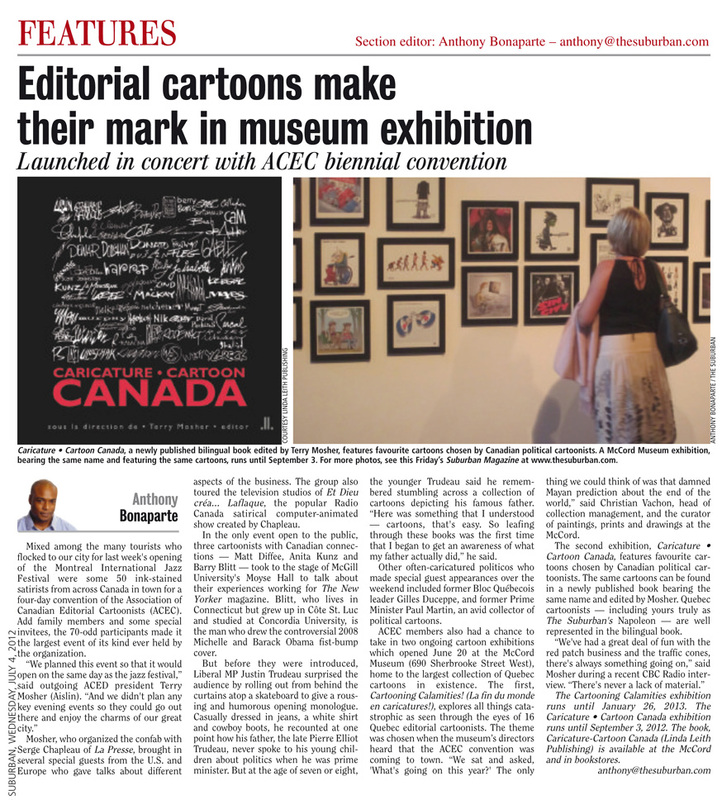 ACEC members also had a chance to take in two ongoing cartoon exhibitions which opened June 20 at the McCord Museum (690 Sherbrooke Street West), home to the largest collection of Quebec cartoons in existence. The first, Cartooning Calamities! / La fin du monde en caricatures!, explores all things catastrophic as seen through the eyes of 16 Quebec editorial cartoonists. The theme was chosen when the museum’s directors heard that the ACEC convention was coming to town. “We sat and asked, 'What's going on this year?' The only thing we could think of was that damned Mayan prediction about the end of the world,” said Christian Vachon, head of collection management, and the curator of paintings, prints and drawings at the McCord. The second exhibition, Caricature • Cartoon Canada, features favourite cartoons chosen by Canadian political cartoonists. The same cartoons can be found in a newly published book bearing the same name and edited by Mosher. Quebec cartoonists — including yours truly as The Suburban's Napoleon — are well represented in the bilingual book. The Cartooning Calamities exhibition runs until January 26, 2013. The Caricature • Cartoon Canada exhibition runs until September 3, 2012. The book, Caricature-Cartoon Canada (Linda Leith Publishing) is available at the McCord and in bookstores.